You might say that choosing a pastry or a sandwich for lunch is not exactly a life or death situation, but just think of all those times you stood facing a myriad of options, not even knowing what your options are! An ingenious Japanese invention can recognize items by their shape, size and color, and provide you with instant names and prices for your chosen items. Using this technology, when you place a tray of items on the light table, the camera scans your choices and immediately informs you what these items are. The mechanism uses the objects' shape, pattern, and size to determine what they are. Therefore, it can recognize any items that are differentiated by different shapes, sizes, and colors. While the technology is currently used to recognize pastries, it can theoretically be used on fruit, vegetables, and even medicine. As we've come to expect from smart technology, the recognition mechanism gets smarter over time. A green outline around an item signifies a complete identification. A yellow outline means the computer is not sure; in such instances, the computer will offer up several choices to select from. Choosing the right one teaches the computer to recognize it even better next time. As a consumer, I'm excited to have technology that will help me choose and understand my options better, but for store owners, this mechanism can be a real money-saver. No longer will they have to train staff to recognize every single item before they can work at the register--the computer does it for them from day one. 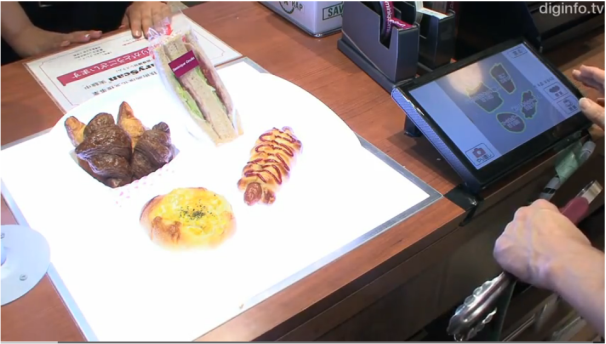 The recognition mechanism, developed by Brain Corporations in cooperation with the University of Hyogo in Japan, is currently on trial run in a Tokyo bakery, and you can watch it in action below.